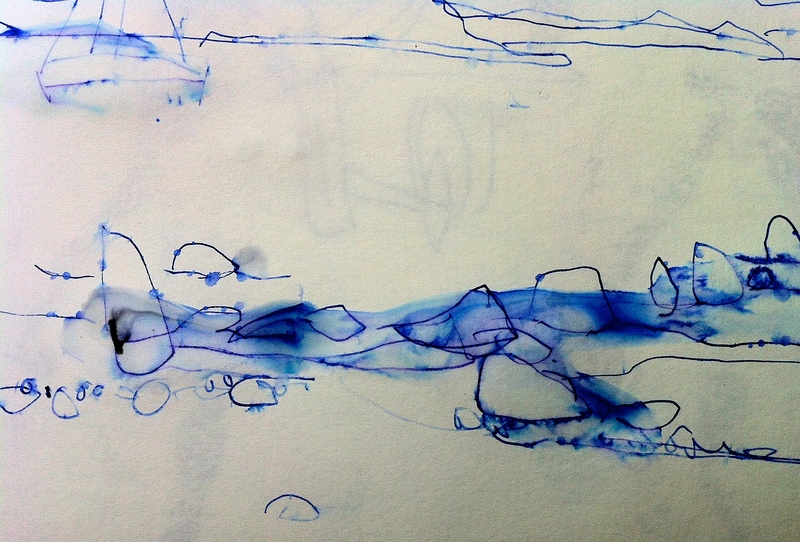 My intention is to use my time on Bryher (see part one) as a space to make work. That’s fine, but I discover that when it comes to it, I am left wondering, is that what I really want to do? I unpack my boxes of materials, open my sketch books, but when I start going through the motions, the old routines, I feel strangely numb, the actions robotic. What is causing this impotence? I am in a stunning location but I feel powerless to render so much beauty with any sense of justification. Is a fear of failure causing this inertia? 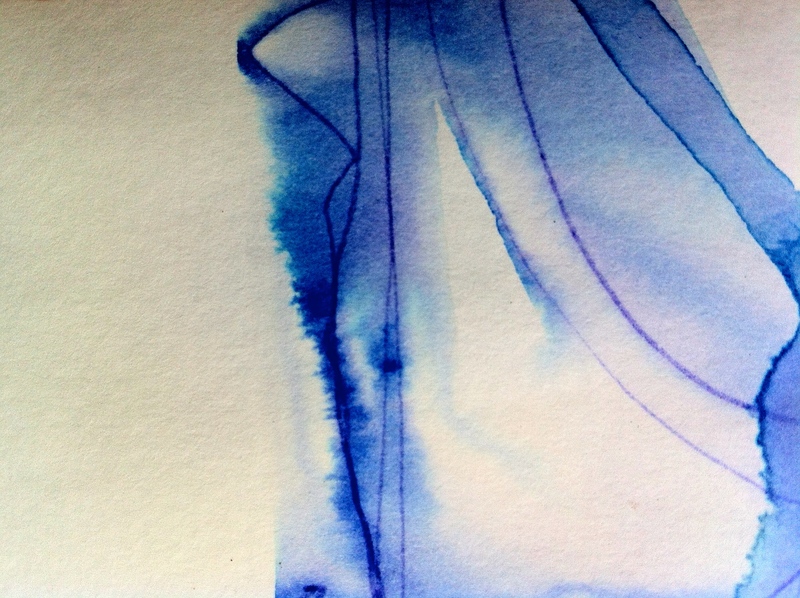 Is my own judgement getting in the way of my creative intentions? What am I actually trying to do? 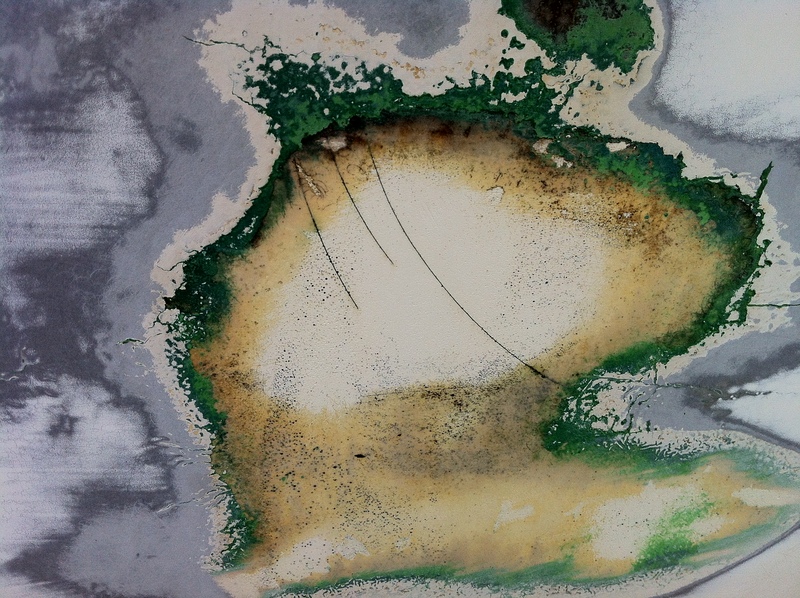 An aerial view of an island? Or the hull of a boat being prepared for painting at a boatyard in Porthloo, St Mary’s? While I was pondering my condition this quote popped up out of the blue. “I believe it was John Cage who once told me, ‘When you start working, everybody is in your studio—the past, your friends, enemies, the art world, and above all, your own ideas—all are there. But as you continue painting, they start leaving, one by one, and you are left completely alone. Then, if you’re lucky, even you leave.” Philip Guston. But I recognise some of these inhibiting factors from past experience, so I revert to my default mode and concentrate on getting a feel for this place, its people, its history, its topography, before I even attempt to tackle what is in front of me head-on: more a quest to decode the sign language this landscape presents to me. 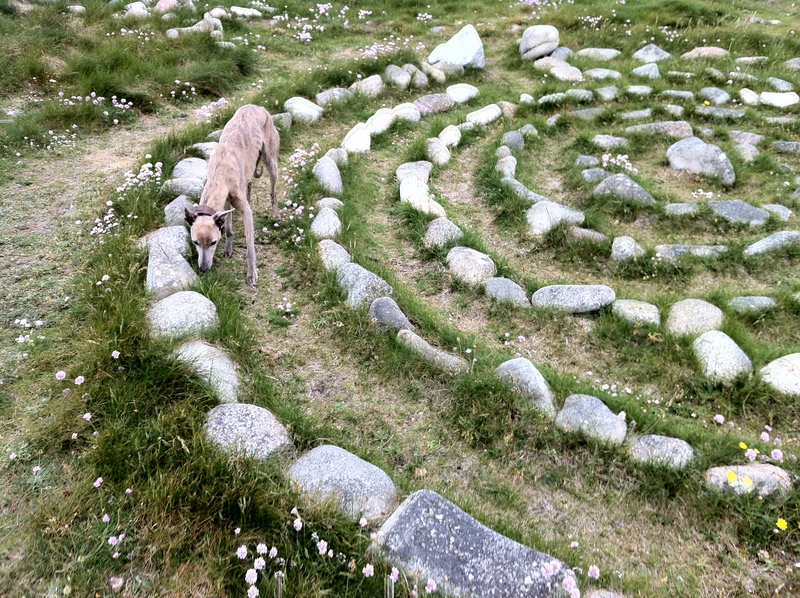 a long, thin dog walking in a large pebble labyrinth just above the beach. 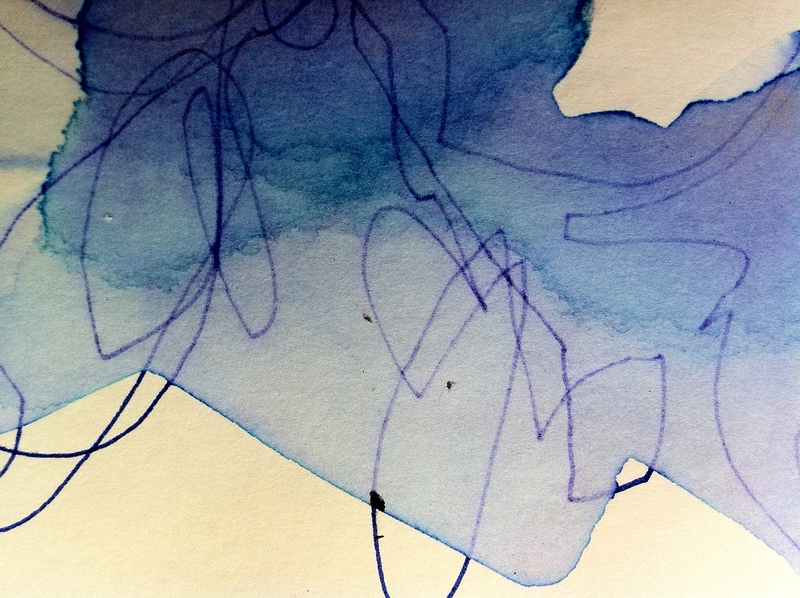 But first, in order to break through this temporary creative blockage and chase away this Bryher-sized mountain of expectations, I need to ground myself and establish my bearings by walking the landscape and scrutinising the cartography. The first couple of days here on Bryher I have felt strangely unsettled. My North / South internal orientation has flipped and it takes a while to re-adjust to the magnetic North within my own body. 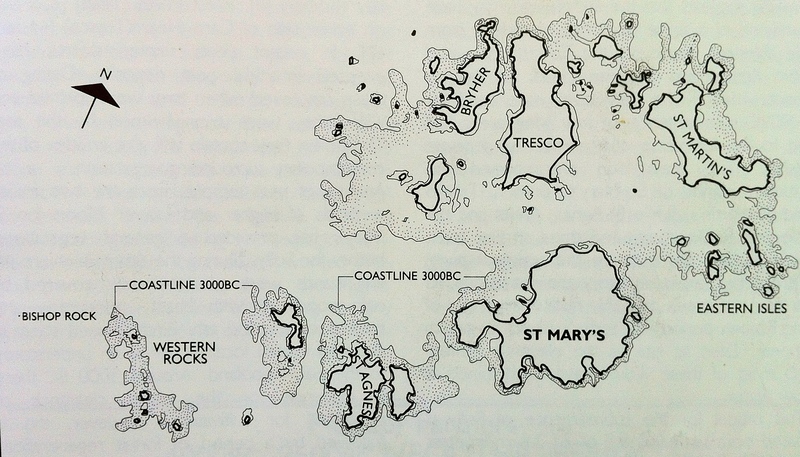 As you can see from this image above (taken from one of the guide books kindly left for visitors in my cottage), the Scilly Isles looked very different 5,000 years ago when sea levels were lower. Compare that with a current map of the Scillies and I begin to imagine how prehistoric Scillonians might have lived their lives. 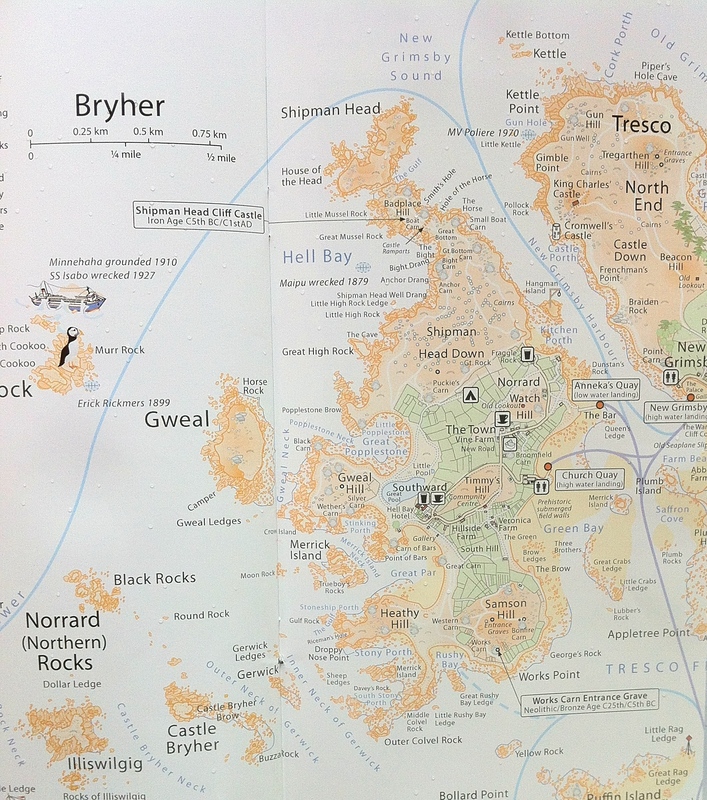 For instance, areas of land dedicated to the dead, such as the northern section of Bryher, would have once served a larger community and is echoed by the Northern slopes of Tresco, now separated from Bryher only by a narrow channel of water (see above map). The duality of opposites: my desire creates a battle between the opposite twins of hope (intention) and despair (fear). 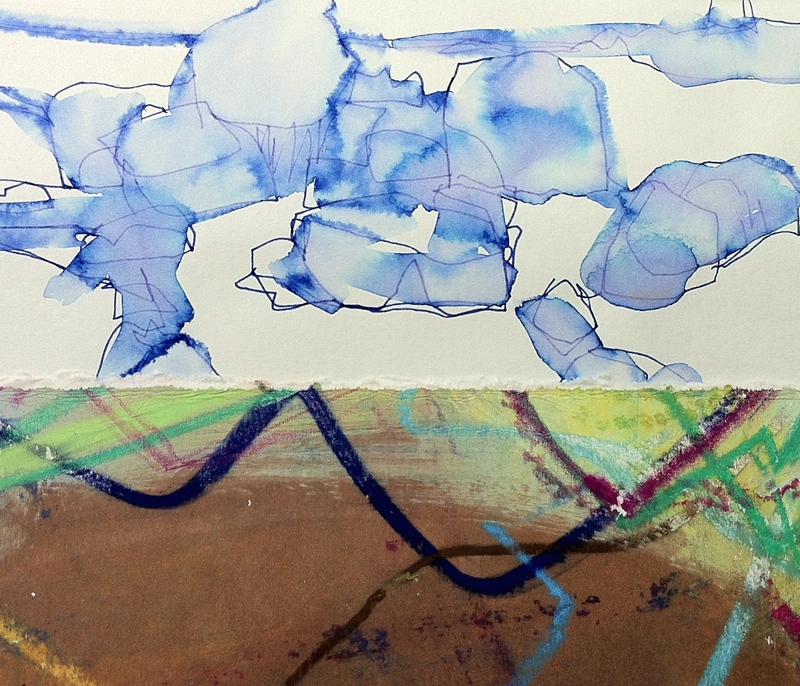 In terms of creative inspiration, in the past, I have found that exploring opposites is fertile ground for me: light / shadow; above / below; beauty / imperfection (arguably the same); staccato / slow movement; colour / absence of colour; composition / chaos; stasis / flow, etc. etc., and this retreat is no exception. I wasn’t looking for opposites, certainly not expecting to find them, but the more I walk around Bryher, exploring its nooks and crannies and feeling its voices echoing back at me through the ages, I begin to feel a distinct pattern emerging. A notion that this is an island story of two halves. Take its extremes of weather: it faces the full brunt of winter storms thrown at it from the Atlantic, yet a peaceful idyll when the seas are calm and the sun blazes down on deserted, bleached beaches. This sense of calm in a time of peace also belies the amount of ships that have floundered off these treacherously rocky shores, thwarted by rows of jagged teeth that emerge from the waters along its western coastline, aptly nicknamed the Wreckers. This is a place that can bite back and gobble you up if you are not careful. Even this seemingly benign island is divided by its topography. The gentle southern slopes of Bryher are sheltered, verdant and inhabited. Flowering succulents grow in profusion like weeds in the hedgerows and the air is scented with herbage. (Similar conditions to the famous Abbey Gardens on Tresco, just across the small channel that separates these two islands). You would be forgiven for thinking you had stumbled into a garden paradise which time had forgotten. flowering succulents growing in the hedgerow in the south. By contrast, the northern plateau of Bryher feels like a shadow land: a desolate and eerie place where the terrifying might of the waves gouge out huge, black gaping holes in the coastline and the thin layer of vegetation hugs the ground to escape the desiccating winds. I begin to realise why this northern place, inhospitable to man as a place to live, the exceptional concentration of cairns here indicating it was probably much more suited as a place to bury the dead, even though in the Bronze Age this would have been good agricultural land due to the mini heat wave conditions at the time. It was also used for defensive purposes with names such as Badplace Hill, and House of the Head (a chilling reminder of the Iron Age Celts and their cult of head worship) which can be reached only by going over The Gulf. Entering into this place that overlooks Hell Bay, is like going over a threshold. There is even a demarkation line where the vegetation clearly changes from small, neatly mown fields to untamed scrubland with a spider’s web network of paths strung over it. I didn’t meet another soul on my visit here, even on a warm Spring day, when the wind was moderate, and the sea slight. I was constantly worried about the dogs disappearing over the edge of the cliffs and was pleased to leave this plateau and its ghosts behind me. But it didn’t leave me. I was left pondering about this landscape. 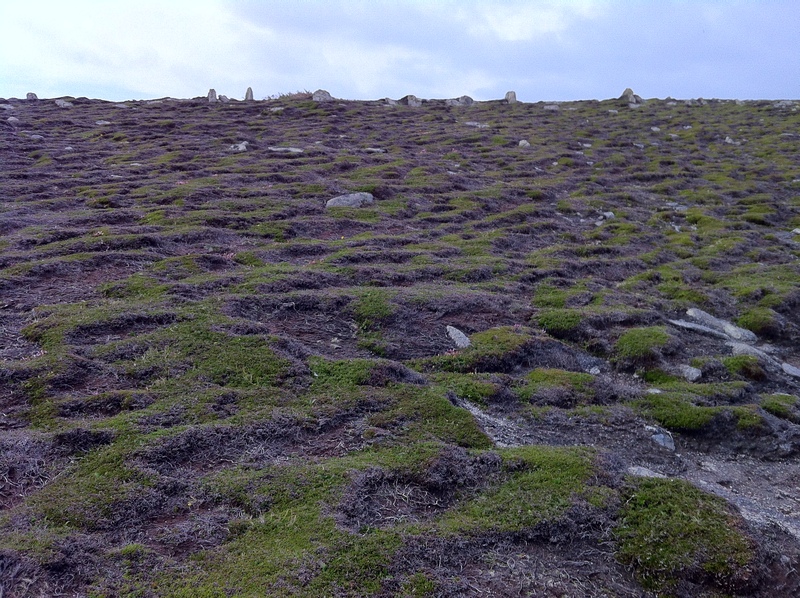 On top of Shipman Down Head, lying amongst the many cairns, I come across a long row of granite standing stones. Was it a stone row or ceremonial way, a defensive boundary, or a tribal boundary? Who Knows? It echoes the row of stones I found on the beach at Green Bay in the south, which were the remains of prehistoric field walls, now submerged by the tide twice a day. This discovery threw up another contrast, this time extremes of tones: the stone row standing starkly ‘white’ amidst the darker vegetation, contrasting with the submerged field boundary, its seaweed covered boulders marching into the sea, broodingly ‘dark’ against the blonde, sandy beach. Having explored as much of the island as I can, going from granite outcrops, entrance graves, cairns, beaches, hilltops, sand banks, even a Hangman Island and back, I am beginning to get a feel for the place and add my sketch books, pencils and pen to the collection of dog bags and old stick of lip slave in my pockets before I set off on my daily roamings. And just draw. Anything. No drawing takes more than a few seconds to do. I have to work quickly especially when rain drops fall onto my paper wanting to make their own contribution to my presence. 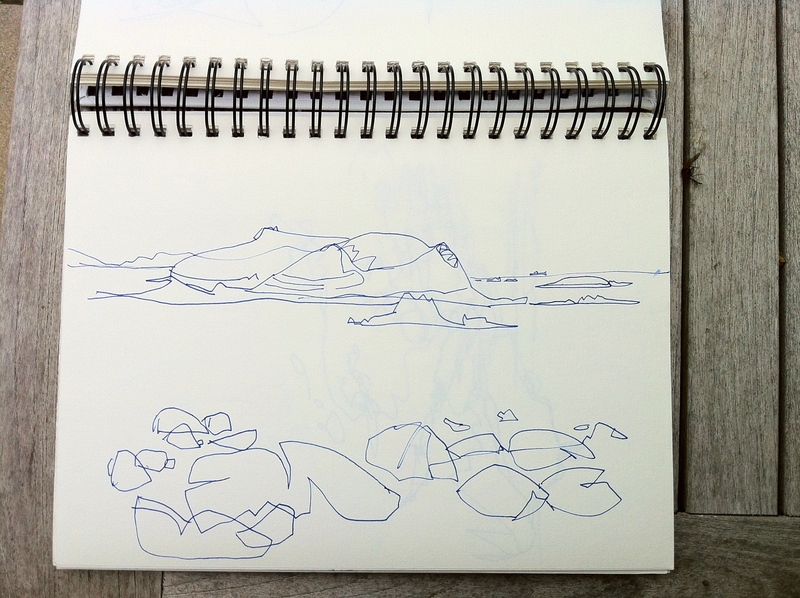 A boulder on the beach, a line of rocks in the sea, a tree blown into shape by the wind, and in the process, I realise that my drawing is a way of looking, a way of seeing the landscape around me. A way into a process. What could be more elemental than that? Each mark made with the pencil or pen comes from an unconscious place, unfettered by judgement or notions of precision. 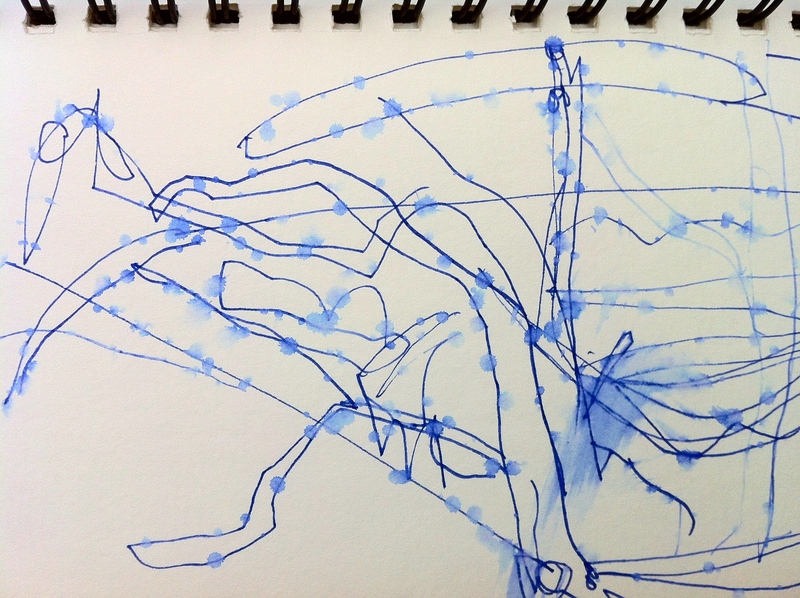 A simple interpretation of what is in front of me rendered by a line, a scratchy mark, a dash, a smudge. A shaded patch here or a line going off at a tangent there. I am beginning to be ‘left completely alone‘. And tried a few simple mono prints based on my drawings. Back home, I may not have achieved what I had set out to do but I have returned buzzing with new ideas, consumed by the names of that shadow land: The Gulf, Hell Bay, House of the Head. Entering that dark place via a Threshold (my word): A Gateway between this and the Otherworld, between normal consciousness and a spiritualised consciousness. Combined with insights that emerged from my recent pilgrimage, these are the things that fire my imagination, the places that I want to inhabit, re-visit, to explore what they mean to me in my own deep places, and it is to these very places where I shall be heading with my next body of work. Where the visible and the invisible meet in me and find an outlet in my practice. And in that free-flow, reach that still point in my heart, the meeting point between heaven and earth: the only really meaningful meeting of opposites. This retreat has served to remind me that my desire to create can only be achieved once I have let go of any expected outcome. Where hope and despair dissolve into simple, clear vision. Something, obviously, I need to keep reminding myself. And it is in this process where, if I’m very lucky, ‘I’, the judgemental part of ‘me’, will leave. To visit other ideas about ‘room’, this weeks photo challenge, see here. Beautifully written account of your descent into yourself. That creative threshold is a wonderful place to reach! Yes, “full emptiness”, I like that. Thank you Elyn.